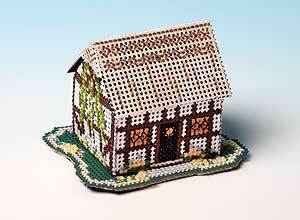 A new range of little buildings stitched on perforated paper. The kits contain 14-count stitching paper, backing card, felt, stranded cotton, needle, chart and full instructions. Primrose Cottage has a thatched roof and half timbered walls. Spring is on its way and the garden is blooming with primroses and forget-me-knots. The cottage stands 4.8 cms high and the base is 6.7 cms from end to end and the roof is removable so it can be used as a gift box if you wish.